Roger Charlery, better known as Ranking Roger, the frontman for the classic UK ska and two-tone group The Beat (known as The English Beat in North America) died this week. He was only 56, diagnosed with a brain tumor and lung cancer last year. Many of us who came of age in the late ’70s and early ’80s are crushed by this news. The music of The English Beat was an important part of my youth. The English Beat broke up in 1983. Immediately after, Ranking Roger formed General Public along with his English Beat partner, Dave Wakeling. They were just in time for the MTV crowd; I remember dancing to “Tenderness” at many a party in my college days! If you’re not in my age group (ahem…) and don’t know the depth of Roger’s repertoire, you might be surprised how many songs are perfect for indoor cycling! The English Beat has long made appearances in my cycling classes, ever since I was certified in 1996. For one, many of their songs are shorter (3 minutes or less) and make for great short high-intensity intervals; that short length also makes them perfect for recovery songs. I often like to use songs from the same musical group for recovery in one interval classes—it’s a musical reminder for everyone to ease up from the hard work and recover. 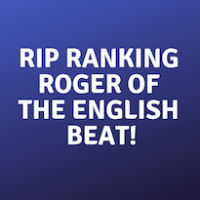 In fact, just last week, only one week before Roger died, I used four English Beat songs in my Over/Under Intervals profile (the tracks I used are first four songs in my list below). Most importantly, though, many of their tracks are in the mid-80s bpm range—a characteristic of the ska and two-tone genres—reflecting a “flat road” cadence if you follow the beat. It’s a bpm that is not quite as readily available in current EDM and pop (although you can find it in hip-hop and emo genres). Here are some of my favorite English Beat and General Public tracks, plus a bonus track with Smash Mouth featuring Ranking Roger, and how I use them for indoor cycling. Perfect for a short interval, with enough energy to push hard, but not so much that you can’t use it as recovery—especially, as I noted above, if you use all English Beat songs for recoveries in one interval class. And I just love the saxophone in this song! Use it like “Mirror in the Bathroom.” It’s even shorter, making it a good recovery after a fairly short interval. One of their most popular songs. A little milder energy than the two preceding songs; perfect recovery or as part of your warm-up. Recovery, endurance. Or, take that ska energy and put it into the pedals as a racing simulation or high-intensity interval in Z4, increasing cadence on the chorus. A faster beat—which, as you know in indoor cycling, often means a slower rpm—translates to a cadence of 79 rpm (half of 157 bpm). Use it for a fast climbing interval or a segment on a longer climb. The video is a live version, which is at 96 bpm. I’m using this clip instead of the radio version of the song so you can see Roger in his glory on stage. Like The English Beat songs, the energy of this track could be used for both harder pushes and milder recoveries, but this time at 90 rpm. This one sounds much more retro, perfect for your 1980s theme ride. Climb to this one, standing up on the chorus if desired. Use this excellent version of The Staples Singers song for a higher-cadence stretch of road. A great track at a higher cadence that is short enough for intervals or recovery. What’s your favorite English Beat or General Public song? Are you perhaps new to them and are surprised by how sprinkling these into your indoor cycling repertoire can add some ska zing? Love all of these. RIP!